LAYLA IS ABOUT AS SWEET AS THEY COME. SHE HAS HER MOMENTS OF WANTING TO PLAY, BUT THEY ARE VERY SHORT LIVED. SHE PREFERS TO BE IN YOUR LAP GETTING LOVE. 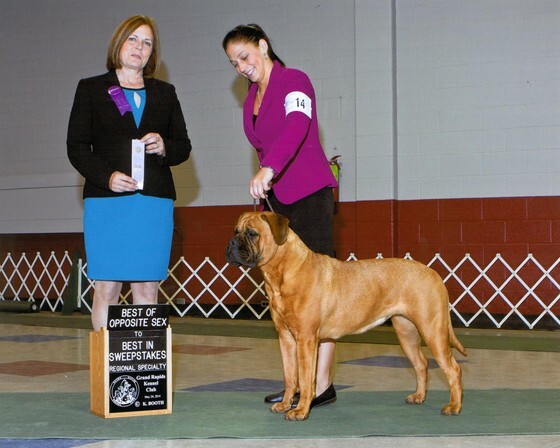 LAYLA WINS BEST OF OPPOSITE IN SWEEPS AT THE GREAT LAKES BULLMASTIFF REGIONAL SPECIALTY UNDER BREEDER JUDGE PAM KOCHUBA!